Perhaps the most seminal aspect of Rotter’s contribution to the p53 field is the establishment of the paradigm that mutant p53 has a gain of function in carcinogenesis. In a series of important studies starting with a seminal paper in Cell (1984), she was the first to demonstrate that introduction of p53 (known today as mutant p53) into p53-null cells significantly facilitated their oncogenic activity in vivo and in vitro. This study was further substantiated by a Nature paper, in which an in vitro model of transformation was utilized to assess the oncogenic activity of mutant p53. These findings practically kick-started the whole field of mutant p53 gain-of-function, in which she may be considered as one of the most prominent figures worldwide. Some more recent major contributions to this field from her research include the realization that tumor-associated mutant p53 isoforms promote cancer through their transcriptional activity (2001 and subsequent publications), and that a major component of their oncogenic activity involves the ability to render tumor cells more resistant to apoptosis. In recent years, Rotter was leading successfully the quest to identify genes whose modulation underlies mutant p53 gain-of-function, and these findings are having major impact on mutant p53 research. As seen in the Figure, cell lines express mutant p53 induce tumors in mice (left), knock-down of mutant p53 (right) abrogates this carcinogenic activity. Over the past years, much of Rotter’s research activity was focused on the establishment of in vitro models for studying the role of p53 in cancer progression. These efforts yielded a number of different novel types of malignant transformation models of great potential. Furthermore, through extensive gene expression analysis and adoption of system biology approaches, she made and continues to make important contributions to the understanding of the molecular mechanisms that underlie distinct steps in the conversion of normal cells into fully malignant cells. Along the years, her laboratory re-examined the role of p53 in cell differentiation and development by using several models of cell differentiation. More recently she focused on understanding the role of p53 in the life of stem cells. 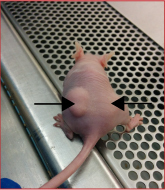 Her early studies show that p53 is central in regulating cell reprogramming and, in agreement with others; her group found that wild type p53 exerts a negative effect on stem cell reprogramming. Her more recent novel data shows that p53 plays a pivotal role in preventing malignant transformation of induced pluripotent stem cells and that mutant p53 exerts a gain of function activity in inducing cancer stem cell phenotype. These observations are of great relevance for understanding the role of mutant p53 in cancer development, at large and in LI-Fraumeni syndrome, in particular. Our suggested model is illustrated below. The understanding that mutant p53 exhibits an oncogenic gain of function activity in tumor cells, prompted the search for ways of altering the mutant p53 protein conformation into a wild type p53 conformation. The idea being that by such an approach you may eliminate the oncogenic phenotype of the cancer cell and concomitantly induce apoptosis by the refolded wild type p53. Together with Dr. Perry Tal and Prof. Moshe Oren, they are examining the possibility that small protein peptides will function as agents that can convert the mutant p53 into the wild type p53 protein conformation and thus represent cancer therapy. 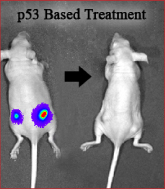 Indeed, as demonstrated in the figure, injection of mice with malignant cells expressing mutant p53 results in tumor development (left), whereas treatment with small peptides targeting mutant p53 leads to tumor regression (right).